Review: Do you love to read action-filled, edge of your seat fantasy novels? How about books with crazy made-up characters? If you do, you should read the book Curio by Evangeline Denmark. Curio is a book primarily intended for a middle school audience, although adults would enjoy it as well. The character Grey is full of determination and stubbornness. She tries to keep her friends safe and won't let anyone stop her. Curio is written in a style that switches off characters' point of view with each chapter. Curio has no pictures and complex vocabulary. Curio has many scenes and situations that are full of excitement and suspense. I believe the moral of this story is to always help friends, even if it puts you in danger. 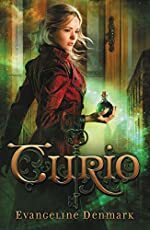 I really enjoyed reading Curio, and I know you will too. We would like to thank Blink for providing a copy of Curio for this review. Have you read Curio? How would you rate it?